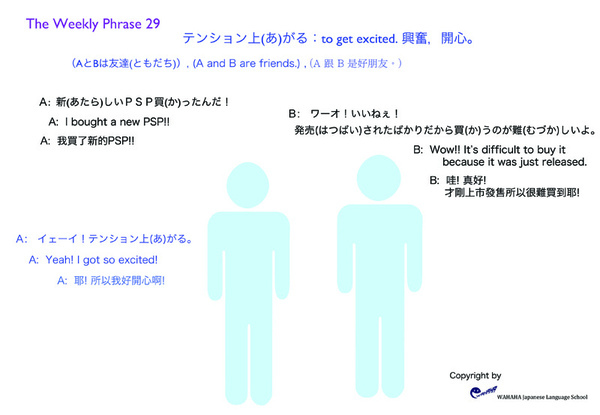 A: I bought a new PSP!! B: Wow!! It’s difficult to buy it because it was just released. A: Yeah! I got so excited! 機嫌(きげん)が悪い(わるい)：woke up on the wrong side of the bed. A: Do you want to go to movie tonight? B: Sorry, I don’t want to go to anywhere tonight? A: How come? New one has just started. B: I said I don’t want to go out. It seems like you woke up on the wrong side of the bed today. Please don’t be so strict. A: We will have a quiz tomorrow. A: Yes, it is. You’d better review the textbook. B: Oh, teacher~. Please don’t be so strict.